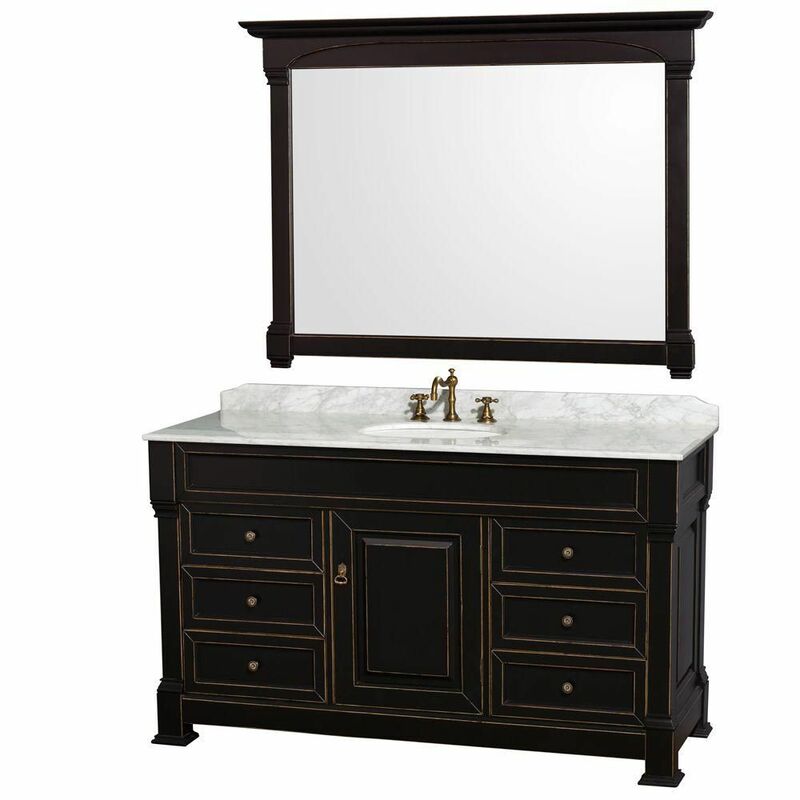 With a classic look and strong design, this vanity will help any bathroom look nicer. The good-looking white marble counter and black solid wood base make a big difference in your bathroom. The single-door cabinet and drawers are great for putting away bathroom items. Put together your perfect bathroom with this stylish vanity set from Wyndham Collection. For some added traditional style in your bathroom, choose this beautiful vanity. The white marble counter and brown solid wood base make a beautiful look in your bathroom. Its double-door cabinet and drawers have lots of room to keep all of your bathroom items. Redo the style of your bathroom with this classic from Wyndham Collection. This vanity is a great way to add traditional style to your bathroom. Its beautiful beige tan marble counter and white solid wood base bring a great new look into your bathroom. The simple look of the double-door cabinet and drawers is useful and classic. Put together your perfect bathroom with this stylish vanity set from Wyndham Collection. For a bit of traditional style in your bathroom, choose this beautiful vanity. Its white marble counter and white solid wood base are very easy on the eyes. Made with a roomy double-door cabinet and drawers, this vanity has lots of room to keep items like toothpaste, towels, and hair brushes. This simple vanity set from Wyndham Collection will fit right into any bathroom decor. Andover 60-inch W 6-Drawer 1-Door Freestanding Vanity in Black With Marble Top in White With Mirror With a classic look and strong design, this vanity will help any bathroom look nicer. The good-looking white marble counter and black solid wood base make a big difference in your bathroom. The single-door cabinet and drawers are great for putting away bathroom items. Put together your perfect bathroom with this stylish vanity set from Wyndham Collection. Andover 60-inch W 6-Drawer 1-Door Freestanding Vanity in Black With Marble Top in White With Mirror is rated 5.0 out of 5 by 3. Rated 5 out of 5 by HomeDepotCustomer from Great quality. Looks beautiful in my bathroom. ... Great quality. Looks beautiful in my bathroom. Rated 5 out of 5 by Cindy from The packaging for shipping was excellent. The vanity is a... The packaging for shipping was excellent. The vanity is a beautiful very well built piece. It’s more beautiful in person. Couldn’t be happier with it. Defeninetly worth it. Thanks!